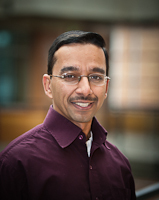 Rajesh Rao's research spans the areas of computational neuroscience, brain-computer interfaces, and robotics. His current research focuses on how the brain makes decisions based on noisy sensory information and how brain signals may be used for controlling computer interfaces and robots. Rajesh received his Ph.D. from the University of Rochester and was a Sloan postdoctoral fellow at the Salk Institute for Biological Studies in San Diego before arriving at the UW. He is the recipient of an NSF CAREER award, an ONR Young Investigator Award, a Sloan Faculty Fellowship, and a David and Lucile Packard Fellowship for Science and Engineering. He is the author of the new textbook Brain-Computer Interfacing: An Introduction and has co-edited two books, Probabilistic Models of the Brain and Bayesian Brain. He directs the Neural Systems Laboratory at UW CSE. With Adrienne Fairhall, he recently offered the first MOOC on Computational Neuroscience. His not-so-copious spare time is devoted to Indian art history and to understanding the ancient undeciphered script of the Indus civilization, a topic on which he has given a TED talk.